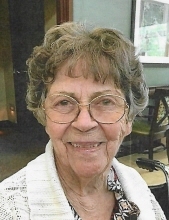 Grace (Coffey) Caulder, 91, of Ottawa, died on Saturday night, February 9, 2019 at the Ottawa Pavilion. Gravesides services will be held 3 p.m. on Thursday, February 14, 2019 at Oakwood Memorial Park, with Rev. Duane Kaufman, officiating. Arrangements have been entrusted to the Mueller Funeral Home in Ottawa. Grace was born on November 30, 1927 in Mayberry Township, IL to Floyd and Hazel Irene (Tyler) Coffey. She married Francis Withrow on May 24, 1947. He passed on October 25, 1969. She married Larry Caulder on January 11, 1989. He passed on July 24, 1995. Grace attended Christ Church United Methodist. She also assisted with blood drives, advent workshops, and helped with dinners at the food bank. She is survived by a daughter, Jennifer (Gary) Weygand, of Ottawa, 4 grandchildren, 7 great grandchildren, a brother Floyd (Judy) Coffey, of Ottawa, a sister Lois Yasm, of Ottawa, and several nieces and nephews. She was preceded in death by her parents, her first husband, Francis, her second husband, Larry, a son in infancy, Gary Withrow, and a daughter Pamela Seibert. Memorials may be directed to the family. To send flowers or a remembrance gift to the family of Grace Caulder, please visit our Tribute Store. "Email Address" would like to share the life celebration of Grace Caulder. Click on the "link" to go to share a favorite memory or leave a condolence message for the family.